Our resident expertise in the aviation industry is global. Our aviation security guards and experts have worked in airports throughout the country and in the Middle East. They bring an advanced awareness of global security and the technological know-how to anticipate threats and devise effective and safe solutions. 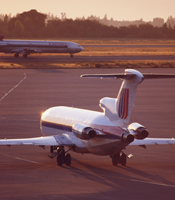 International travel presents unique challenges that Safety Net Security has proven ability to meet and exceed. We understand that aviation security guards must deliver services with customer service in mind. That’s why we combine highly professional security experts and personnel to work within the parameters of global aviation security. We safeguard all your assets, from your workforce and the public, to physical assets like your infrastructure, facilities and internal policies and procedures, all under the watchful eye of governmental regulations. Safety Net Security provides all levels of aviation security aimed at preventing unlawful interference with civil aviation and protecting and securing equipment and facilities. We understand what is necessary to keep travelers safe, while respecting timeliness and ease of movement of passengers. That’s why our passenger screening and supervisory services including aviation security guards are in demand. Our aviation solutions apply to all functions of an international or regional airport, from logistics to technology.